Your eyes are one of your most precious assets. The gift of sight cannot be overstated. That’s why the Maynor & Mitchell Eye Center team is so committed to the screening and treatment of eye diseases and conditions. Read below to learn more about the specialized care available at Maynor & Mitchell Eye Center. Most everyone age 60 or older will be affected by cataracts. This extremely common eye disorder occurs when the natural proteins within the eye’s lens begin to clump together, distorting vision. “Cloudy” and “hazy” are terms often used to describe vision when a cataract is present. When cataracts first become noticeable, many people compensate by using brighter light, seeking large-print materials, or wearing stronger lenses. As time passes, however, surgical correction becomes necessary to maintain sight and handle everyday tasks such as reading and driving. Maynor & Mitchell Eye Center is widely recognized as a leader in cataract treatment. During cataract surgery, the clouded areas of the lens are removed, and an intraocular lens (IOL) is placed in the eye. IOLs are small, thin, flexible plastic lenses that permanently restore vision after cataract surgery. Many cataract patients are surprised and pleased with their quality of vision with IOLs. 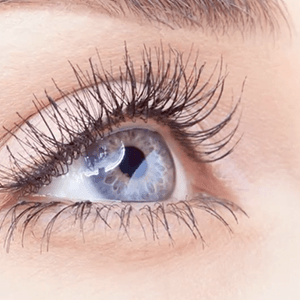 Today’s advanced technology is far superior to IOLs used even a few years ago. Lenses by Crystalens® are considered “accommodating,” which means they work with the muscles of your eye to focus on near, middle, and far objects, in many cases without the need for additional bifocals. 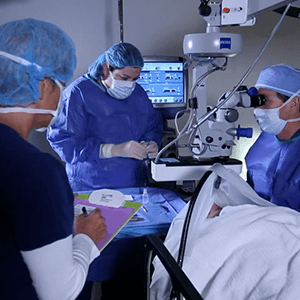 Other patients find great success with ReSTOR® lenses, which use a specialized technology known as adopized refraction, meaning that the lens is built in tiny concentric circles that manipulate light in different ways to handle a wide variety of visual tasks. Both Crystalens® and ReSTOR® IOLs produce vision that is clear and sharp under almost any condition. Glaucoma is a disease that occurs when there is damage to the optic nerve of the eye. The optic nerve is an extremely sensitive and sophisticated structure that carries all of the eye’s visual images to the brain for processing. Left untreated, glaucoma can cause vision deterioration and even blindness. A number of conditions, including excess pressure within the eye, may contribute to this potentially devastating disease. Glaucoma is particularly insidious because it often begins without any symptoms. The only way to know if your eyes are affected by glaucoma is to have a diagnostic eye exam performed regularly, beginning at age 35. Although there is no known cure for glaucoma, early detection and treatment can greatly slow the progression of the disease. At Maynor & Mitchell Eye Center, we offer comprehensive detection, treatment, and management for glaucoma eye disease. 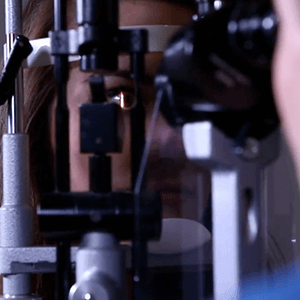 Using today’s technology, we can quickly and accurately check for signs of glaucoma. Treatment options range from topical medications (eye drops) to laser surgery, depending on the severity of the case. Please contact Maynor & Mitchell Eye Center today to schedule an eye exam and glaucoma screening. Macular degeneration is a condition best described as a loss of central vision: when you look straight ahead, objects directly in front of your eyes look blurry, while your peripheral vision stays clear. Age-related macular degeneration (ARMD) occurs when the light-sensing cells of the macula, a portion of the retina, cease to perform properly. ARMD occurs most often in people age 60 or older. Other, hereditary forms of macular degeneration can occur in children and young adults, although these cases are much rarer. The two forms of ARMD are wet and dry. Dry accounts for 80% to 90% of cases, causing small tissue deposits to form on the macula. Because the disease progresses very slowly, many people do not notice that their vision has deteriorated over time. Untreated dry macular degeneration may develop into the more severe form, wet macular degeneration. This condition occurs when the body responds to dry macular degeneration by forming additional blood vessels within the eye. These vessels can leak blood and fluids, causing further damage and vision loss. 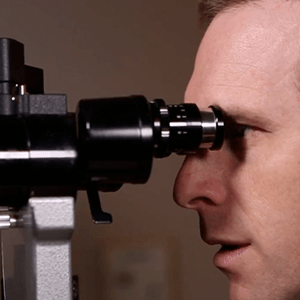 The best way to screen for macular degeneration is through regular eye exams. Should signs of dry or wet macular degeneration be detected during an eye exam at Maynor & Mitchell Eye Center, we offer advanced and effective treatments to slow the disease. Specialized medications or laser surgery may help you keep your sight. For more information about our macular degeneration screening program and treatment options, please contact us today. Did you know that the uncontrolled blood sugar levels associated with diabetes can affect the eyes? Diabetic and pre-diabetic patients are at risk for a condition called diabetic retinopathy, in which the blood vessels in the eyes become damaged. These patients are at risk for vision loss and, eventually, blindness. The two types of diabetic retinopathy, background and proliferative, both require thorough treatment in conjunction with your other diabetes therapies. Background diabetic retinopathy progresses slowly and may not present any noticeable changes in the patient’s vision. Even if there are no symptoms, however, damage can be occurring within the eye. If you are diabetic, regular vision screenings are necessary to understand if background diabetic retinopathy is occurring. Proliferative diabetic retinopathy is an extremely serious medical condition that needs rapid treatment to prevent permanent damage to the eye. If you are diabetic and experience sudden loss of vision, you may have proliferative diabetic retinopathy and should seek emergency medical care immediately. Specialized treatment for diabetic retinopathy is available at Maynor & Mitchell Eye Center. Our goal is to help you keep your eyes safe, healthy, and functioning properly. We offer comprehensive testing services and a variety of medical and surgical treatment options to prevent diabetic retinopathy from stealing your sight. Please contact us today for more information about our options for diabetic retinopathy screening and treatment. Do your eyes often sting, burn, and feel dry and sore? Do you sometimes have the sensation that there is a foreign body in your eye? Do these irritations cause your eyes to water excessively? These symptoms can indicate the presence of dry eye syndrome, a lack of natural moisture in the eye. With dry eye syndrome, your body does not produce enough tears to keep the eyes clean and neutrally balanced. There are many different physical and environmental factors that can cause dry eye, including long-term contact lens use, living in a dry climate, insufficient blinking, eye and eyelid diseases, certain systemic diseases, and some medications. Fortunately, the uncomfortable and painful symptoms of dry eye can almost always be easily treated. Depending on your symptoms, contact lens rewetting drops, artificial tears, or new prescription medications that can stimulate the production of natural tears may be used to treat your dry eyes. Severe cases may also need to be treated with lacrimal plugs or surgery to close the tear ducts, both of which keep your own tears from draining away too quickly. Dry eye is a condition with many different causes and treatments. At Maynor & Mitchell Eye Center, we’re experts at managing dry eye syndrome and helping your eyes feel comfortable. If you think you may have dry eye syndrome, please give us a call.